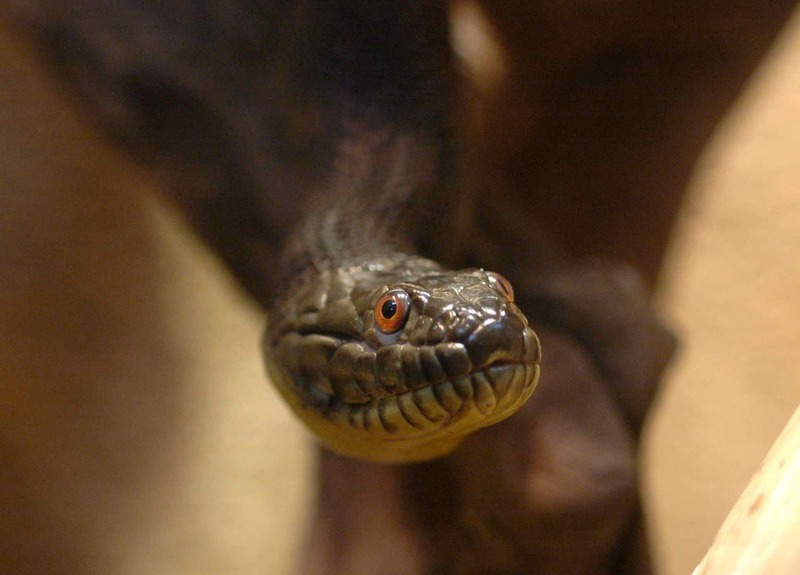 The experimenters looked at blood flow in the eyes of coachwhip snakes by illuminating the eyes from certain angles to get the light to reflect back off of the blood vessels. They looked at the snakes when at rest and when “threatened”—the threat was that one of the experimenters would be visible to the snake while “performing[ing] routine laboratory activities,” so either these snakes were rather high-strung or “routine laboratory activities” in this lab means making scary faces and pretending to be an eagle. I would work in that lab. It turns out that the blood vessels in the spectacle are often constricted so that no blood can flow, making them almost invisible, so they don’t obscure the snake’s vision. 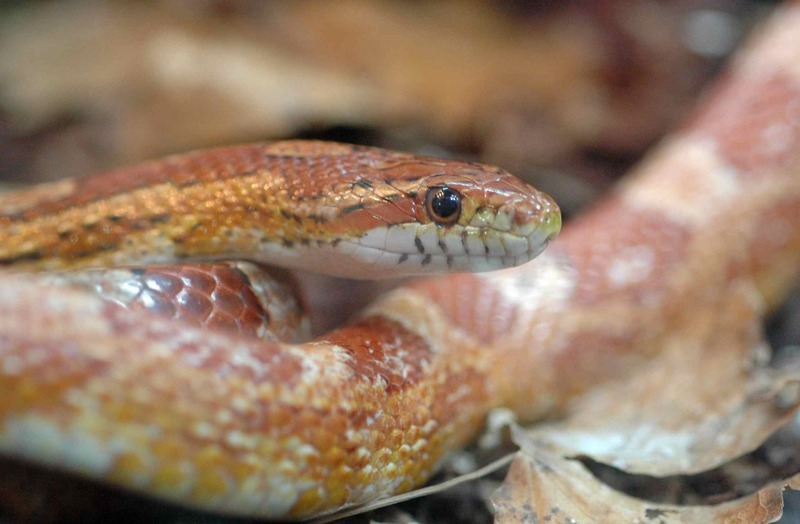 Snakes at rest allow the blood vessels in their eyes to fill with blood about one out of every three minutes. 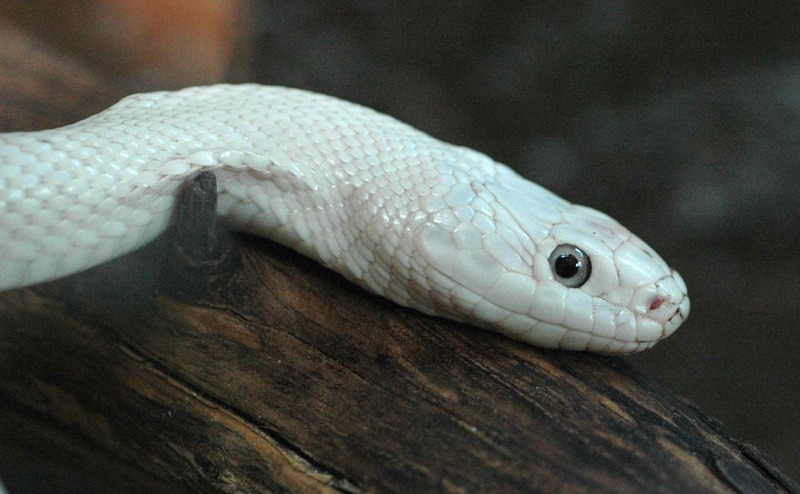 Snakes feeling threatened, however, cut in half the amount of time that the blood vessels are full. It’s better to deprive your spectacles of blood for a little while than to get eaten by a predator you couldn’t see. There’s one other problem with protecting your eyes with a piece of your skin, however: snakes periodically shed that skin, meaning that they periodically have to make a new spectacle underneath the current one. During this “renewal” period, the blood vessels are never fully constricted, probably because they’re needed to bring nutrients to the cells that are building the new spectacle. This is bad news for the snake’s vision. Reptiles in general are known to be especially vulnerable during shedding; poor vision due to these blood vessels may be one reason why. 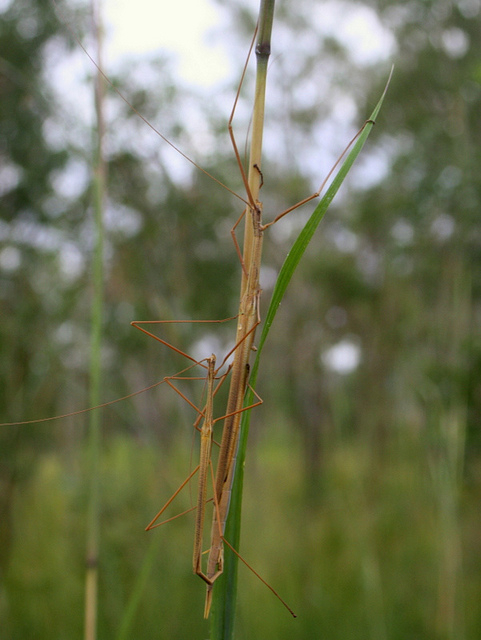 Have you been waking up in the middle of the night tormented at the thought that you may never know how walking sticks decide where to place their middle legs while walking? Well, unless you know what words like “ipsilateral” and “femoral chordotonal organ” mean, this paper may not fix that. However you can rest assured that scientists are working on the problem! It’s a very important problem, for sure. When humans and cats walk, we decide where to step based mostly on visual information: we look where we’re going. 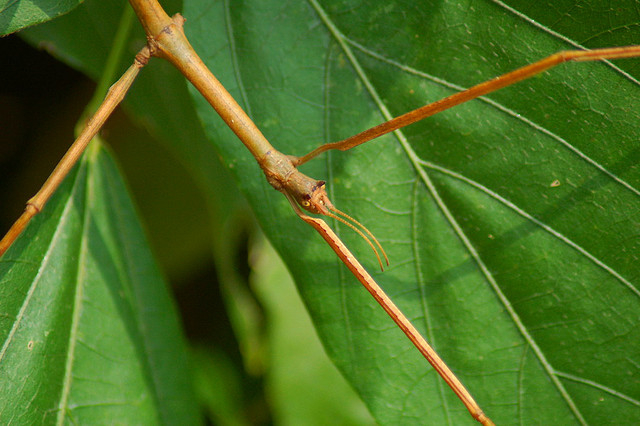 Most walking sticks—or more accurately, stick insects—are nocturnal, meaning it’s dark when they’re walking and they can’t see where to put their feet. Plus, they have to climb all over “a complex three-dimensional maze of twigs and leaves.” Plus, they have six feet to deal with. We know that they use their antennae to feel around and figure out where to put their front feet; it’s the middle and hind feet that are still a puzzle. Where do I put this middle foot?? To study whether the insects place their feet based on the relative positions of their other feet, the experimenters tethered the insects (so they couldn’t actually move forward) on a surface covered with a lubricant (so that their legs could slide along as they “walked” in place), then induced them to walk by showing them a pattern of stripes. They found that the insects’s feet did seem to target the previous location of the feet in front of them, the way you would want to if you were climbing a ladder: how do you know where the rung is if you can’t see it? If your middle right foot was just standing on the rung, then your back right foot should aim for where that foot just was. However, the insects’ back feet were better at the targeting than the middle feet. I guess if you’ve got six feet, you can afford to be sloppy with some of them. How many stick insects can you find in this picture? van Doorn K, Sivak JG. 2013. Blood flow dynamics in the snake spectacle. Journal of Experimental Biology 216:4190-4195. Wosnitza A, Engelen J, Gruhn M. 2013. 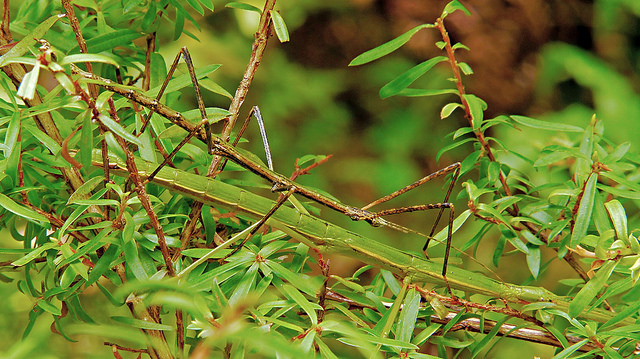 Segment-specific and state-dependent targeting accuracy of the stick insect. Journal of Experimental Biology 216:4172-4183. This entry was posted in featured paper, invertebrates, other people's research and tagged biology, Journal of Experimental Biology, research, science, snake, stick insect by toughlittlebirds. Bookmark the permalink. I liked the info on the snake eyes. Good post. Photos of snakes are great! Are they all yours? Thanks! Yes they’re all mine. 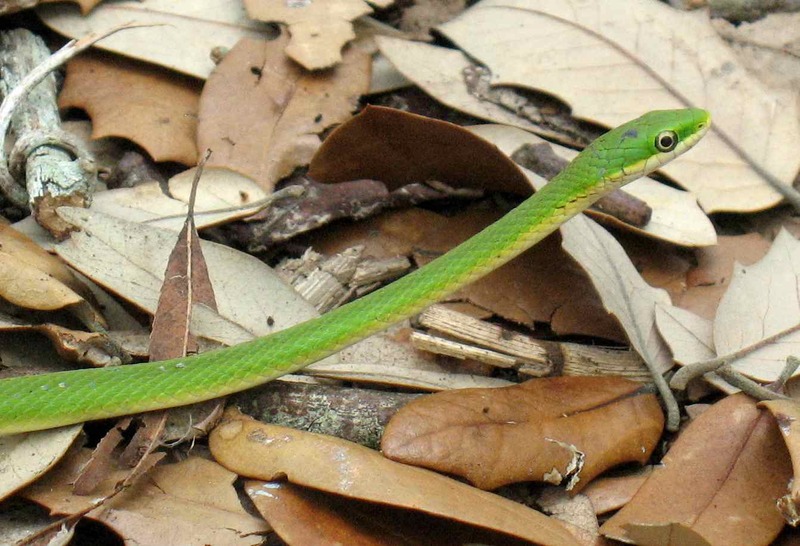 The rough green snake is from Texas; the other three were at a nature center in Illinois.